From early years kids naturally like exclusive definitions, and have to be weaned off this. This would be easier if we were more careful with the word “is”. Even to me the statement ” a square is a rhombus” sounds weird, if not actually wrong. It would be better to be less brutal, and say “a square is also a rhombus” (and all the other such statements). Even better, and quite mathematical, is the phrasing “a square is a special case of a rhombus”, as the idea of special cases is very important, and usually overlooked. It is odd that the classification of triangles is done entirely with adjectives and the difficulty is thus avoided (but see later). I then got thinking about the words “triangle”, “quadrilateral”, “pentagon” etcetera. The odd one out is the quadrilateral. 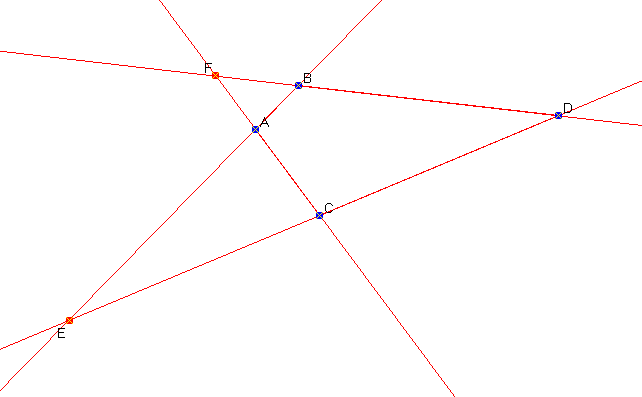 Then we can see that the quadrilateral is determined by the points of intersection of the two pairs of lines ab,cd and ac,bd. But if we consider the four lines then there are three ways of pairing them up. The two others are ab,ac with bd,cd and ab,bd with ac,cd. 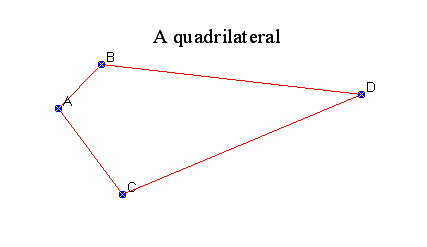 This gives us two more quadrilaterals, and they all have the property that each side falls on one only of the four lines. Not only that, but also the first two are fitted together to give the third one. This arrangement is called the “complete quadrilateral”, and has four lines and six points. A drawing is worth a thousand symbols ! This year, I’m teaching younger students than I’ve ever taught before. These guys are 11 and 12. They’re newer than iPods. They watched YouTube before they learned to read. And so, instead of derivatives and arctangents, I find myself pondering more elemental ideas. Stuff I haven’t thought about in ages. Decimals. Perimeters. Rounding. And most of all: Multiplication. It’s dawning on me what a rich, complex idea multiplication is. It’s basic, but it isn’t easy. So many of the troubles that rattle and unsettle older students (factorization, square roots, compound fractions, etc.) can be traced back to a shaky foundation in this humble operation. What’s so subtle about multiplication? Well, rather than just tell you, I’ll try to show you, by using a simple visualization of what it means to multiply. 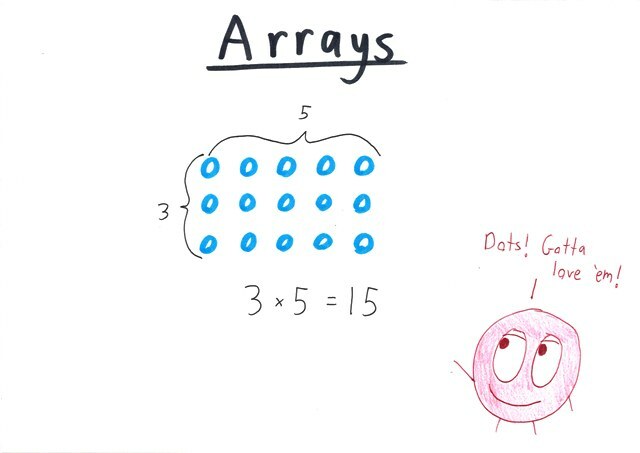 Multiplication is making an array.